eBay sellers are always looking for low-cost, high-profit items to sell. They may frequent thrift stores, garage sales, estate sales, or consignment stores for deals on items to flip on eBay. Preowned shoes are one of the most popular. If you can get past the "ick" factor of handling, cleaning, photographing, and shipping someone else's preowned shoes, you can make good money on eBay. What Are the Best Brands to Sell? The best brands to sell are not what most assume. High-heeled, high-fashion, expensive designer brands like Christian Louboutin, Jimmy Choo, Prada, Coach, and Gucci are not the best money makers. First, sellers have to find those items at a low enough price to sell them for a profit on eBay. Also, these shoes need to be authentic. Yes, shoes can be counterfeit just like handbags. So, it is wise not to delve into the high-end designer shoe market. The best brands to resell on eBay are practical, comfort, well-constructed, durable, everyday shoes. Here are the top 5 brands that hold their resale value and are popular worldwide. Doc Martens. This brand originated in the United Kingdom and is a popular with the grunge crowd, as well as in food service. Characterized by black leather, heavy buckles, and thick lugged soles, Doc Martens are a cultural icon and sell well globally. Sellers may find these shoes at thrift stores for around $3, and they sell at a steady $50 and up depending on condition, size, and color. Naot. Originating in Israel in 1942, Naot shoes are known for quality construction, comfort, and style. These shoes can cost over $300 new and can sell for $100 on eBay, in used condition. This is definitely a brand to learn about if you aren't familiar with them. Birkenstocks. This brand brings back the nostalgia of the 1960s and Woodstock—the shoes of hippies! This brand is a great seller on eBay. In fact, Birks that look like they have been run over by a car sell well; so, don't worry about a little dirt or footprints in the footbed of the shoe. Birks in new condition can retail for over $200 and can sell on eBay in preowned condition for over $100, depending on the size and condition. Cole Haan does not have the cultural following of Doc Martens or Birkenstocks; they are known as a conservative and practical shoe brand. Cole Haan makes everything from sandals to boots, and regular retail price can be over $300 for men's dress shoes. Cole Haan also makes other leather goods, including jackets, handbags, briefcases, belts, and vests, which also hold their resale value well. On eBay, used Cole Haan shoes can sell for over $100. SAS (San Antonio Shoemakers) used to be a brand associated with the elderly, but not anymore. Family owned and made in the USA, this brand is the epitome of comfort for folks with feet problems or for consumers who just like comfy shoes. SAS makes sandals, dress shoes, boots, work shoes, and athletic shoes. Original retail for SAS shoes can be over $200, and they sell consistently on eBay, in preowned condition, for an average of $50. If you are going to resell shoes on eBay, it is important to understand why people buy used shoes online. Aren't preowned shoes gross? 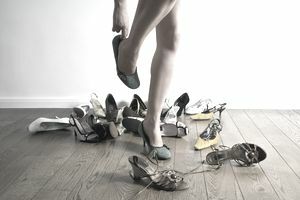 Someone else's foot has been in the shoe, and that can mean odor, fungus, or other health issues. Sometimes, that is true. However, cost and availability are two reasons why consumers buy on eBay. For example, the retail price of a pair of Mephisto shoes is easily upwards of $350. Mephisto shoes, among other brands of shoes, are known for quality construction and materials, comfort, style, and durability. However, many people do not have $350 to shell out for a pair of shoes; so, they look on eBay for quality shoes in gently used condition. Additionally, size may be an issue. Wide and narrow widths can be difficult to find in a retail store and online. If you have ever shopped for someone with a wide or narrow foot, you can relate. Sometimes, eBay is the only option when wanting a specific style of shoe in a specific size and color. Honestly, sometimes people just don't care if the shoes are used and broken in. A construction worker may need a good quality brand of shoes or boots and can't justify spending over $100 on a new pair, especially to trod in mud or dirt all day. This is true with any shoe worn in a profession where things get messy, such as food service or the medical field. And let's not forget kids' play shoes. Mom and Dad might not want to spend big bucks to buy a brand new pair of sneakers for kids who are just going to wear them to play outside in the dirt, mud, or snow. Why Do Comfort Shoes Sell Better Than Fancy Dress Shoes? As our population ages (Baby Boomers are leading the way), foot comfort is of paramount importance. With almost 80 million Baby Boomers - and older Gen Xers right behind them -, there is a huge market for comfortable shoes. Baby Boomers are a generation of doers—they aren't going to sit around as their parents did. They are active and want to stay active as long as possible. But, as we age, feet problems may be the first sign of needing to slow down; so Baby Boomers seek out comfortable shoes so they can continue their active lifestyle of traveling, exercising, working a part-time job, or whatever activity they desire. And they can find exactly the shoes they need on eBay at an affordable price.